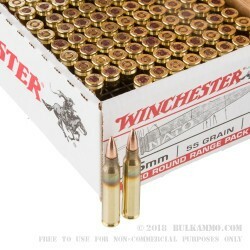 Winchester's 5.56 range pack includes 180 rounds of fresh 5.56x45mm rounds loaded to M193 specs. 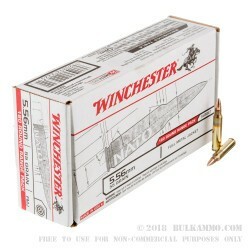 This ammo features a 55 grain full metal jacket projectile that is accurate up to medium ranges and is made relatively affordable due to the huge scale that 5.56 ammo is made with to support our military. As a result, excess production finds its way to consumer's rifles at a lower cost relative to similar sized rounds that don't have the benefits of a NATO cartridge. After 9/11, Winchester was awarded a second source contract to supply the U.S. military to ensure that the US wasn't solely dependent on the Lake City plant. 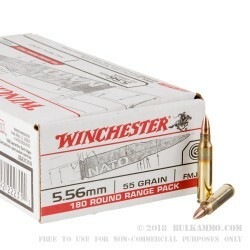 Winchester has answered the call increasing their 5.56 capacity and in between contract runs sells off high quality ammo well suited for range use at a competitive price point. 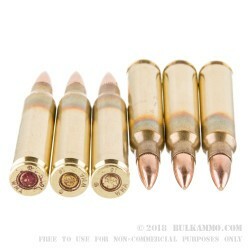 A: Tony this Winchester 5.56 ammo use a lead core copper-jacketed projectile and are loaded into brass casings. There are no magnetic components in the production.